Our fully integrated Primary School Programme. Find out more. AMAZING! English is our Primary Programme. AMAZING! 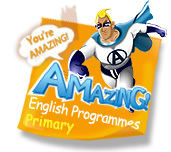 English Enrichment is designed to help children develop their confidence in speaking, writing and communicating. Our AMAZING! English Enrichment utilises many of the educational resources produced by our award winning Educational Research Department and Publishing Company. Our AMAZING! English Enrichment course is designed not only to reinforce, but exceed the Ministry of Education primary school requirements. Integrated teaching techniques and student-centred themes ensure our materials are easy to follow, meaningful and stimulating. Our integrated materials guarantee students learn more, faster. The Reading Book engages the students with lively characters and entertaining narratives. It is also level and theme appropriate and covers accelerated reading skills development, vocabulary development, spelling, grammar and phonics. The Phonics Book focuses on pure international phonics (as endorsed by the Singapore Ministry of Education), spelling and pronunciation. The lessons have been designed to encourage students to practice their phonics and pronunciation in an energetic and natural way. Our Patterns Book is integrated with our Reading book ensuring that grammar points are reviewed, expanded on and practiced. Various activities are employed to encourage students to review, reinforce and practice key grammar patterns in a stimulating and practical way. The Student Activity Book introduces conversations, writing activities, grammar activities, spelling exercises and listening comprehension exercises. The Student Activity Book reviews material covered in the Reading Book and the Patterns Book reinforces previously learnt material and offers essential conversation practice. Our vast range of professional teacher resources (posters, props, puppets, flashcards, flip books, songs and chants) have all been designed and recorded to compliment our student materials. They facilitate active learning through both individual and group activities, games and singing.